First, these are so easy to make, but getting consistent results can be tricky. I tried to make these at my son’s house over Christmas, and used a substitution for the apple cider vinegar. They were like hockey pucks. But, I made them again today and I think I’ve got the recipe down, so I’m going to tell you EXACTLY what I use so if you decide to try them, you have a chance of them working! I would not alter ingredients (or possibly even the brands) at all. If they work, your family will not know that they are not eating bread, they are that good! The baseline recipe for these is from Leanne Vogel, and Keto Diet Blog. Leanne is a nutritionist who writes a food blog, and this is my adaptation of their recipe (see her sloppy joe recipe at the bottom). When I do these, it makes 14. Optional: 2 tbsp sugar substitute, I use Virtue Sweetner from wheatfreemarket.com – you don’t need sugar, it just makes them a tiny bit sweeter. 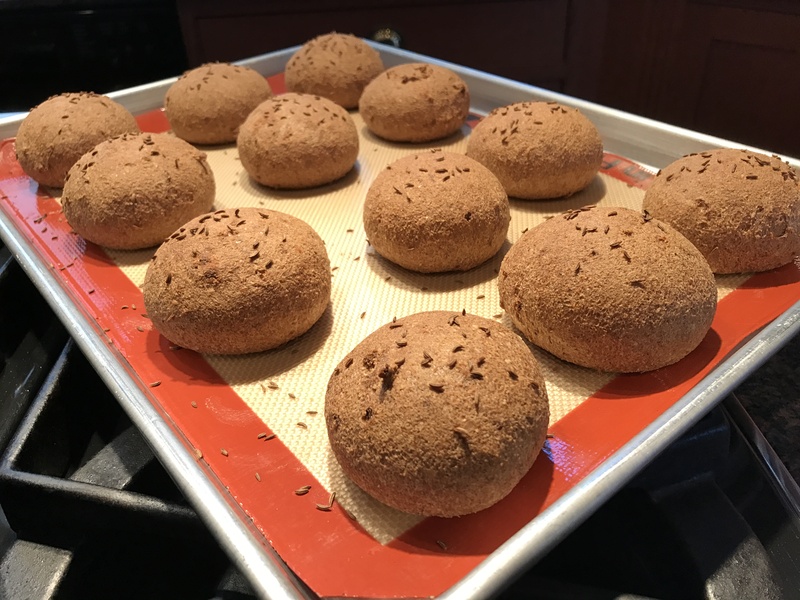 Before placing in oven, sprinkle with sesame seed, poppy seed, or rye seed. Yum. Mix the dry ingredients in a large bowl. Add the whisked wet ingredients and stir minimally until just mixed. Then wait a few minutes, as the psyllium powder needs to absorb the liquid. Then, taking bits with your hand, form a ball shape (that fits easily in the palm of your hand, maybe ¼ cup) and put on a baking sheet. You can use coconut oil to grease a baking sheet, I use a silicone mat called Silpat that keeps things from sticking. Realize that these have a ton of fiber. If you’re eating them for the first time, don’t have four! Especially if you’re introducing high fiber foods as a new thing. Your body needs to adjust and a bit of distention is common, hence go slow. But what’s amazing is how light these are. Ideas? Make tiny lunch sandwiches, sloppy joes (see below), make an egg/bacon/breakfast sandwich or an egg/sausage sandwich. Or, just have them with cheese, or almond butter, jam or pasture butter. Here’s shots of what I use. And the finished buns look great! They also freeze well. Make a bunch and freeze half. This is basically fiber powder. Be sure it is GROUND. You’ll need BLANCHED almond flour. See below for Leanne’s recipe! Here’s Leanne’s sloppy joe recipe, for a Indian twist on sloppy joes!